I hope everyone is enjoying / had a great Halloween! 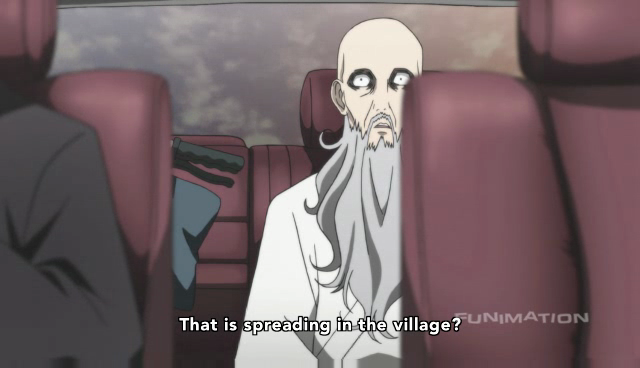 The folks in Sotoba village sure aren’t, well the ones who are still alive aren’t. 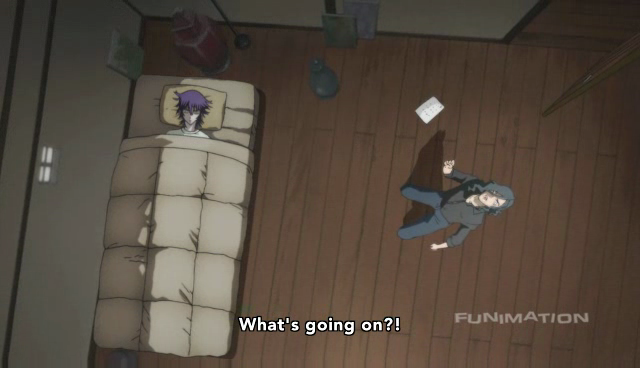 The dead residents seem to be having a grand time, in episode 13 of Shiki. Things are not looking good for the good guys. In some respects nothing much happened this episode that wasn’t already likely to happen from events shown previously, but the weight of these things coming to pass is strongly felt. Further, the momentum here is all going against the remaining humans. Their centers of rebellion have been dealt very serious blows. Kind of a depressing episode, really, because it was unrelentingly bleak. The head monk verifies the contagion with his own eyes. The one surprising card played was the actions of Seishin’s father, the head monk, who travels to see one of the dying villagers with his own eyes. Shiki has such a huge cast of characters that I had forgotten how weird the elder Muroi was. He seems be completely out of it. Perhaps he had a stroke — he travels in a wheelchair, and makes no motions aside from his jaw. Also, those eyes! Seishin doesn’t think his dad knows anything, but if that is true, this was one hell of a red herring. I’m looking forward to seeing Toshio do some tests on his wife. The vampires have been blowing out the humans, I really want to see Toshio turn the tables somehow, even if it’s just a small win. Especially after this episode! Something’s gotta go better than this, or the rest of the show is Shiki taking over Japan. Very dark indeed. Seishin’s dad has done more than his son has so far, lol, so am looking fwd to seeing what the younger monk will (finally do). Toshio looks more and more unhinged, doens’t he; it’ll be interesting seeing hoe he deals with Kyouko, given how little attention he paid to her when she was alive (not that anyone can blame him). More Natsuno pls! And what the hell happened to Masao?! Can’t wait to see it those too will be at it again, like they were when they were alive, with Toru caught in the middle again maybe… we’ll see, I guess!! Yeah, a dark episode but it does open up a number of interesting plot possibilities. It also has led to some speculation that this series will deprive us of a happy ending of some sort. I really don’t think Ono-sensei is going that route. In fact the overriding reason I am on this train is because I want to see where Fuyumi Ono wants to take us. 12 Kingdoms was brilliant especially because of the serious thoughts behind it. Chief amongst these was taking your responsibilities seriously. What in the hell is she setting up this time? You mentioned Seishin. What are his responsibilities in this situation? Maybe that is why Ozaki is keeping him at arm’s length. I have no idea how this is going to be resolved. I don’t have faith in any of the characters at the moment.